Figure 1. Carbon Emissions by Country, 2008. Figure 2. Carbon Emissions between USA and China. Figure 3. Global Carbon Emissions and Future Projections. Air quality is pivotal in terms of maintaining environmental health. China's lack of adequate air quality most significantly contributes to global warming in the greenhouse effect, along with the reduced plant function in the agriculture industry. Air pollution impacts global warming greatly in that the air pollutants act as the main drive force in the greenhouse effect. China stands as one of the largest countries in terms of air pollution and contribution in global warming. The main air pollutant that contributes to global warming is Carbon Dioxide - of which a large amount is produced in China. China, as a country, produces the most Carbon Dioxide in the entire world - almost producing 10 million kilo-tonnes in 2012, which represents almost 30% of the entire worlds' emissions . These carbon emissions through the greenhouse effect further accelerates the effect of global warming, which is detrimental to the environment . A study conducted predicts that by 2050 China would produce over 50% of the world's carbon emissions. The study claims that if China does not swiftly develop carbon efficient machinery, adopt Geo-engineering or switch to nuclear energy, then the global temperature may be increased by as much as 3 degrees on China's increasing carbon emissions . Figure 1 is obtained by the EPA. 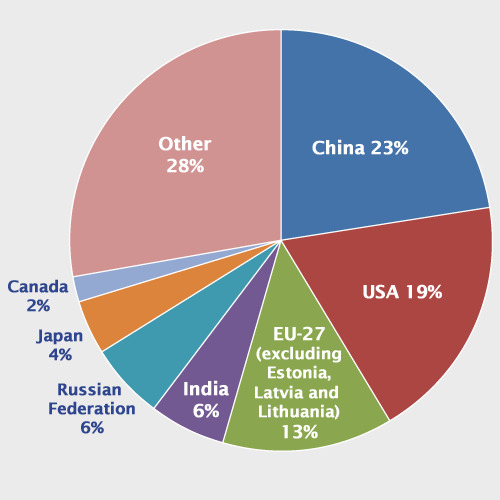 It is a graph showing the carbon emissions by the major countries, taken in 2008. The pie chart is measured in terms of percentiles per country. From the graph, we can decipher that China is indeed the leading country in terms of carbon emissions, producing significantly more than what would be considered 'more developed' countries. This is due to the large industrial and manufacturing base of China, and its large population . 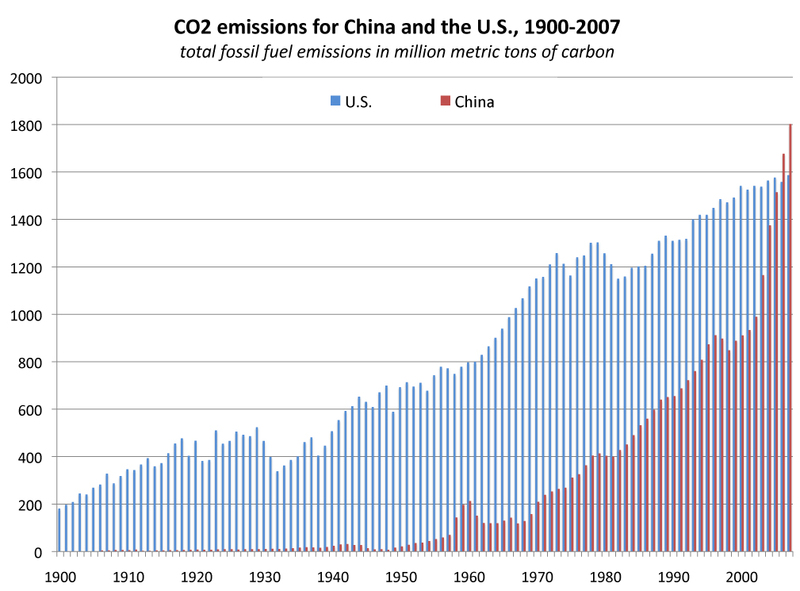 Figure 2 compares the carbon emissions between China and the United States over the past century. In the graph, it is clear that China's sudden increase of carbon emissions was very recent, only lately overtaking the US. China's carbon emissions is indeed exponential, and if it continues to grow at this rate, such emissions may pose a large threat in regards to global warming . Although in recent years China's growth and pollution has been slowing, the country's carbon emissions are still growing nonetheless and need to be quickly addressed . Figure 3 shows a very idealistic projection of global carbon emissions towards the future. The Y-Axis shows the global carbon emissions as gigatons per year, while the X-Axis shows the year. 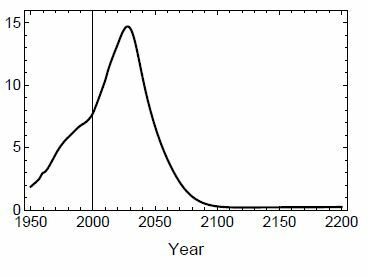 The graph revolves around the optimistic, but not improbable event that China soon makes a strong decision to shift towards alternative methods, namely nuclear energy, and hence rapidly introduce such methods to the world. Only under those circumstances can the projection of figure 3 be fully realised. If China does indeed shift towards nuclear energy, global decarbonisation will be amongst the first positive effects in terms of air quality . 1. Large amounts of smog blocks out sunlight, limiting photosynthesis. The slow but steady accumulation of smog on glass and other transparent screens is clearly observable in more polluted countries such as China. This phenomena greatly reduces the photosynthetic capabilities of plants, which then reduces the growth rate and overall health of plants and crops alike. Smog is particularly detrimental to flora grown in greenhouses. The accumulation of smog and dust particles on the glass panes of greenhouses can reduce the light penetration significantly. Smog also affects crops not grown in greenhouses, by directly accumulating on the cells of leaves themselves . 2. Ozone in the atmosphere destroys plant metabolism by acting as an oxidising agent. A lesser known effect is that of atmospheric Ozone. Ozone is a very subtle but very damaging chemical, especially on the life of plants. Entering through the plant's stomata, Ozone acts as a imposter to oxygen and reacts with plant metabolism while damaging the plant itself. The oxidising effect of ozone is comprehensive - ozone may discolour, and damage the chloroplasts within the leaves themselves, reducing photosynthesis by up to 50%. The substance also hinders water absorption from crops and plants. Such damage naturally leads to the reduction in crop yield and plant growth, crucial for the agricultural industry in China. However, the effects of ozone are very hidden and commonly mistaken and mistreated by farmers . Figure 4 shows the reduction in crop yield of various agricultural plants. 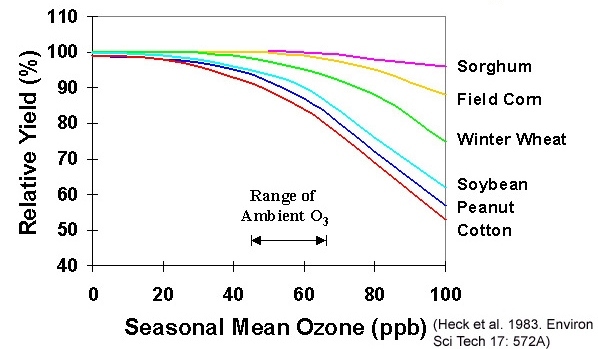 The graph shows that different crops are affected differently by Ozone, but all crops are negatively affected as the amount of Ozone increases. Popular crops such as peanuts and cotton are affected most negatively. At high levels of Ozone, the productivity of crops can be reduced by almost 50%. It is obvious that this constitutes to a large loss in the Chinese Agricultural industry. 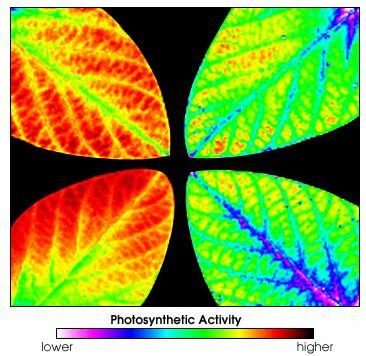 Figure 5, taken by Earth Observatory, shows the efficiency of photosynthesis between two groups of leaves . The leaves on the left side shows a group grown in an ozone-free controlled lab, whereas the leaves shown on the right side displays eaves grown in labs with moderately elevated ozone levels. The photo was taken through fluorescence imaging. We can determine that the group of plants not subjected to ozone has a more efficient system of photosynthesis than the group subjected to ozone levels. 3. Acid rain deals damage to crops, plants and infrastructure. The well known effects of acid rain is undoubtedly a large issue in China. Every year, acidic rain falls on buildings, landscapes and agricultural crops, dealing dealing damage to the economy and the environment. Acid rain is when rain droplets become unusually acidic due to natural and man-made factors. China's infamous acid rain is the result of the high levels of sulfur and nitric particles suspended in the atmosphere, due to China's large industrial outputs. Acid rain is corrosive, and usually erodes away crops and infrastructure. The reaction of acidic substances with crops usually results in lower crop yields. The detrimental effects of acid rain is clearly shown in Figure 6 and Figure 7. Figure 6 shows the germination percentage of crops from seeds. The graph plots this against different pH levels, indicating the acidity of the rain. From the graph, it is clear that the lower the pH, hence the higher the acidity, the less likely the crop is to germinate. The graph compares three different types of crops - peas are shown to be more resilient to acid, whereas canola and wheat both suffer lower germination rates when affected by acid rain. 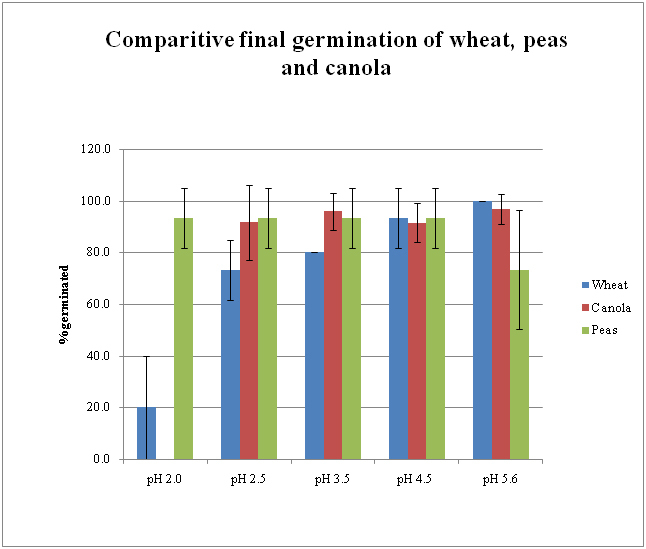 The graph shows that at a pH of 2.0, canola seeds do not germinate at all, only 20% of wheat germinates, and peas only suffer minor decreases in germination. Figure 7 similarly shows the weekly growth height of wheat crops when effected with different concentrations of acid rain. From the graph it can be deciphered that the more acidic the water, the lower the growth height is for the wheat crops, indicating consistent results with Figure 6. As shown in the graph, a pH of 2.0 can decrease the height of a wheat crop by more than 50% compared to normal water. Although it is uncommon for acid rain to reach pH levels of 2.0, pH levels of acid rain easily surpasses measurements of pH 5.0, dealing damage to crops regardless of its severity. 4. Smog indirectly causes global warming, raising temperatures, which interferes with plant enzymes. As previously mentioned, smog in general is a large factor in creating global warming. The slow but steady rise in temperature causes the change in plant enzymes as they attempt to adapt to the new environments. The change in the plant hormones can lead to abnormal and mutated plant specimens. These four factors caused by smog deals comprehensive damage to the environment in China, in particular the agriculture. The reduced capability of the agriculture industry in turn leads to severe damages in the economic sector. Figure 4. Effect of Ozone on Crop Yield, 1983. Figure 5. The Effect of Ozone on Photosynthetic Activity, 2001. Figure 7. 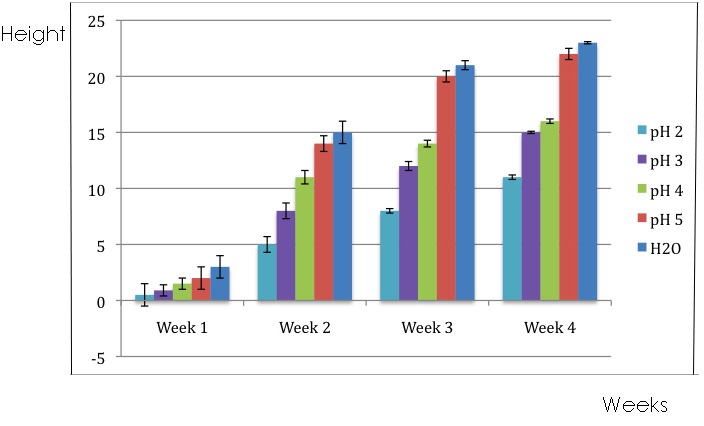 The effect of acid rain on weekly growth of wheat crops.